A widow falls in love with a much younger man, then decides to bear his child in a paradise implausibly haunted by an avenging serial killer. As usual, Goudge (The Second Silence, 2000, etc.) adds a touch of suspense to a tale of a woman finding her strength. 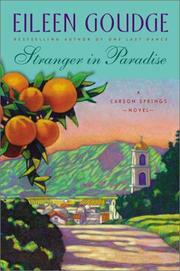 This time, the first of a projected trilogy set in Carson Springs, a California Shangri-la with Spanish architecture and flowers everywhere, begins with a runaway and a wedding. Goudge then energetically goes on to make the connections, some strained, that will corral everyone together for the wrap-up. Finch, a teenaged runaway who has witnessed a murder, flees New York and finds herself part of the wedding as Samantha Kiley’s younger daughter, Alice, marries much older media tycoon Wes Carpenter. Tenderhearted Laura, the eldest Kiley daughter, takes Finch home to her small ranch to join the other strays, including octogenarian Maude and countless animals. Meanwhile, Samantha talks to Wes’s 31-year-old son, Ian, an artist who invites the beautiful 48-year-old widow out on a date. Deeply attracted to each other, the two are soon passionately in love. The affair shocks Alice, a TV producer, and Laura, divorced and unable to bear children of her own, both of whom idolized their dead father. They are further appalled and angry when Samantha announces she’s pregnant and has decided to keep the baby, even though she eventually breaks with Ian because of the age difference. Two people are discovered brutally killed, and Finch, who has finally found a home with Laura, fears the police may suspect her. When tracked down by the NYPD, she runs away to a nearby convent, where she sees the killer setting out and alerts the nuns, just as Samantha alone faces the murder-bent intruder. An agreeable page-turner despite the creaky plot and clunky prose.